An autographed portrait of Langston Hughes, which is housed at the Mary McLeod Bethune Foundation, located at 640 Dr. Mary McLeod Bethune Boulevard in Daytona Beach, Florida. Hughes was born February 1, 1902, in Joplin, Missouri. He attended Columbia University in New York City, New York ,from 1921-1922, but did not complete a degree. Instead, he received a Bachelor of Arts from Lincoln University, located in Chester County, Pennsylvania, in 1929. Hughes was a very notable poet during the Harlem Renaissance. He also produced plays, short stories, and novels. Hughes and Dr. Mary Jane McLeod Bethune became acquainted with one another when she organized a reading tour for him through photographer Carl Van Vechten. He later described Dr. Bethune as "marvelous as mistress of ceremonies." Hughes passed away from complications after abdominal surgery in New York City on May 22, 1967. "Mary McLeod Bethune." Extravagant Crow: Carl Van Vechten's Portraits of Women, Beinecke Rare Book & Manuscript Library, Yale University. http://brbl-archive.library.yale.edu/exhibitions/cvvpw/gallery/bethune.html. Hughes, Langston, Carl Van Vechten, and Emily Bernard. 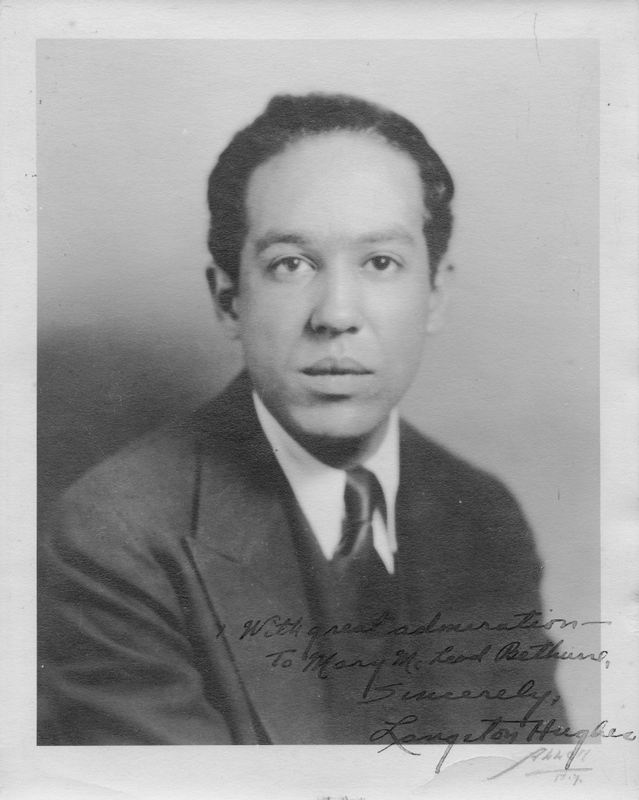 Remember Me to Harlem: The Letters of Langston Hughes and Carl Van Vechten, 1925-1964. New York: Knopf, 2001. Leach, Laurie F. Langston Hughes A Biography. Westport, Conn: Greenwood Press, 2004. Hughes, Langston, Arnold Rampersad, Dolan Hubbard, and Leslie Catherine Sanders. The Collected Works of Langston Hughes. Columbia: University of Missouri Press, 2001. With great admiration, to Mary McLeod Bethune. Sincerely, Langston Hughes. 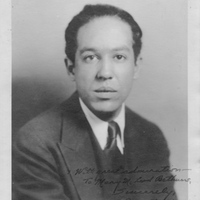 “Langston Hughes.” RICHES of Central Florida accessed April 24, 2019, https://richesmi.cah.ucf.edu/omeka/items/show/2832.